When asked to define luxury travel, the easiest answer is 5* hotels, chauffeur driven cars, first class transport etc. But the reality is that although those things may be the general framework for a luxury vacation, the travel experiences on offer are what create the memories. The reason I have written this preamble is because some may find that the following is anything but luxury, but if the experience is unique, unforgettable (in a positive way), and the encounters are rich then I think that it is a luxury to meet a man like Henri the shepherd and his 600 sheep in the foothills of the Montagne de Lure in the heart of La Haute Provence! I first met Henri in the bistro in my village, he was introduced to me by another villager, Jean-Philippe, one of the many locals who are on the lookout for me, tracking down interesting encounters and visits. 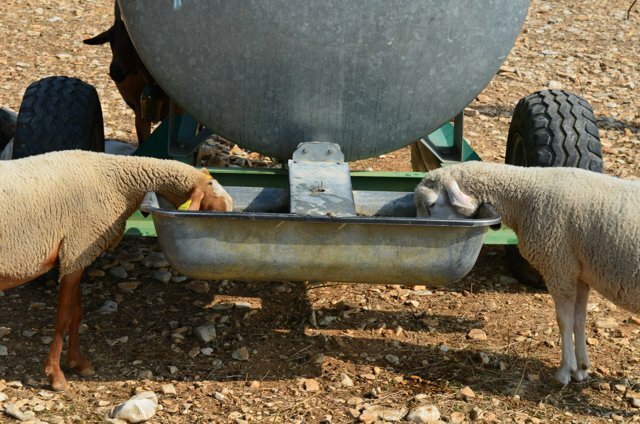 Sheep farming is an integral part of life in La Haute Provence and during my years flying hot air balloons I met nearly all the sheep farmers in the Pays de Forcalquier, and became friends with many. At the end of spring the flocks of sheep are transported to the mountain pastures mainly towards the Italian border and also up on the Montagne de Lure and other smaller local areas, this age old activity called La Transhumance was originally undertaken on foot, but now due to the modern world we live in the animals are mostly transported by truck to the bottom of their pastures and the only the last part is on foot. 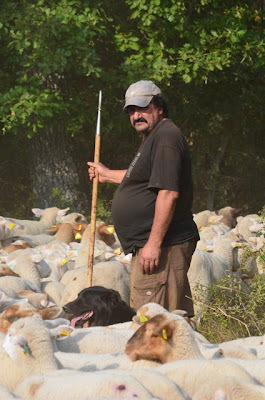 Some do the Transhumance locally taking their flocks to areas which can be reached entirely on foot, others stay in the region with the sheep being taken to different areas every day by their shepherd and his trusty dog Iskra (meaning Spark in Polish). 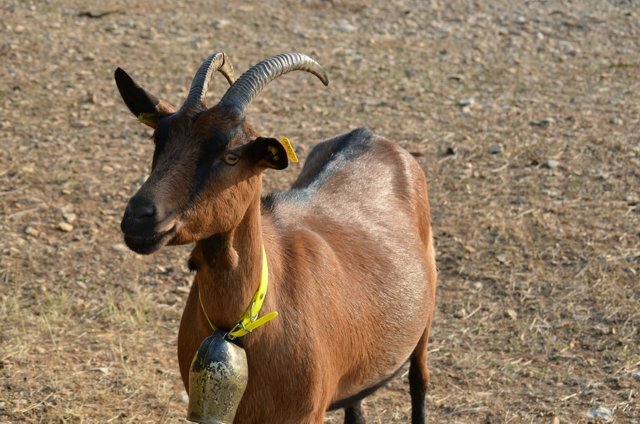 Another particularity of the flocks here are the presence of a goat or two who apparently help the sheep stay together as the goat follows the shepherd better than the sheep, and the other member of the local flocks is the Patou or Pyrenean Mountain Dog. He is there to guard the flocks from wolves who are making quite a comeback on the Italian border, but have also been spotted more locally, usually it is recommended not to approach a flock of sheep, especially in the mountains because the Patou will protect at all costs, so last week when I went to see Henri, the first to greet me was the Patou and I stayed in my car with my 8 year old son. Henri ambled over and shouted over to me “T’en fait pas, il est bon à rien ce con!” which translates as “Don’t worry he’s a useless S.O.B.” and he was! He name was Costaud, which translates as Strong or Sturdy and was the friendliest Patou I had ever met, and according to Henri, if a wolf ever attacked the flock, he could help himself as the Costaud was usually off elsewhere and rarely doing his job, but he was a nice dog and as Henri said, it’s better to have a friendly Patou who provides a bit of company than one that will rip the arm of anyone who has the misfortune to get too close. Henri then opened the pen where the sheep had spent the night and casually said to his remarkable sheepdog Iskra, “Bring them on and keep them right” I was use to very specific commands being given to sheepdogs, but this was the first time I had ever witnessed a casual conversation between man and dog with results! 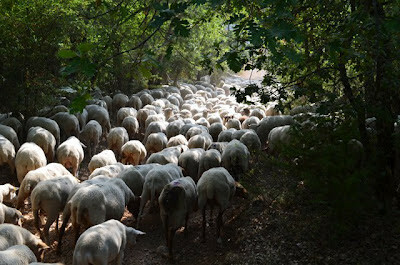 The sheep poured out of the pen and were led to the right by the dog and we began our walk. Each day the sheep are led through the hills and woods where they move like a very coordinated eating machine, when no one is talking all you can hear is munching. 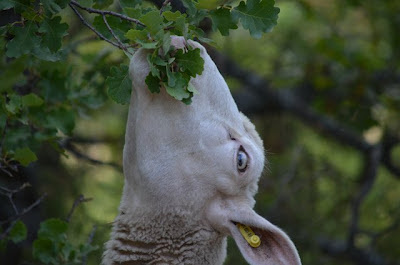 Munching of grass, munching of oak leaves and the occasional Baaaa. 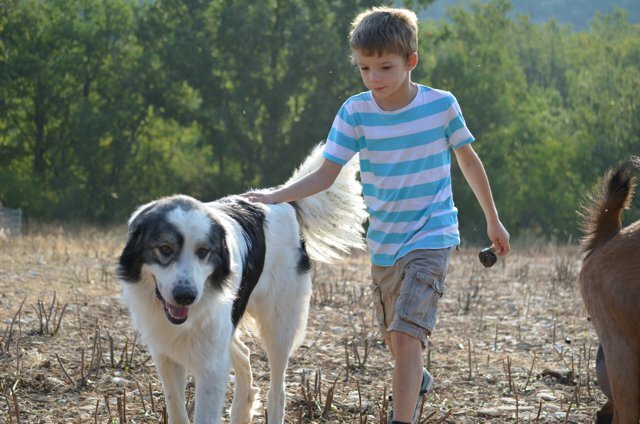 Once an area is cleared of all living vegetation, Henri would look over to his Iskra and give him a command and the dog would perform the required task without hesitating and move the flock to the next area. Meanwhile the Costaud would move to the next shady spot and collapse as if he had actually been doing something, this display of total laziness was commented by Henri but the Patou didn’t seem to care. 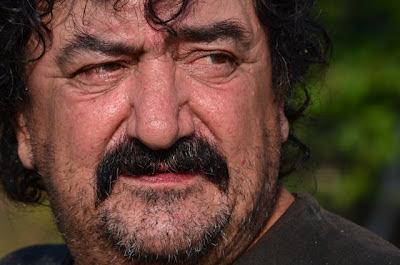 At one point Henri showed me something else that I never knew existed, a gang of rogue sheep, a group of 5 or 6 who would split from the flock and have to be watched carefully with the sheepdog having to make a separate foray to keep them grouped with the others. Walking through the woods and plains of La Haute Provence is fascinating with several different varieties of Lavender growing wild (see In the Footsteps of The Lavender Pickers) along with Thyme and Sarriette, a herb often seen as decoration on local goat’s cheeses. All these are pointed out by Henri who, although not a botanist, needs to know the different plants as some are not good for his sheep. Our walk continued through the woods with stunning views over the local lavender filled valleys when we reached clearings. Henri told me about himself and how he came to be a shepherd. His previous job was that of a disk jockey! “Good fun when you’re young” he said, “…but I like to be alone, and the life of a shepherd seemed to fit the bill” he went on to explain that his family thought he had gone mad when he spent 5 months on a mountainside with 1500 sheep and two dogs for company, sleeping on a straw mattress and having the occasional visitor (often hikers caught in a storm) with whom he could share a meal. But one day members of his family came to visit and he said that they understood at once, “I didn’t need to explain anything “he said “ the mountains did the talking for me” . Ever since Henri is the pride of his family, having chosen a life that keeps him close to nature, and I think he looks like a shepherd not a DJ! Our walk lasted two hours, before the sun gets too hot, and the sheep don’t want to eat anymore, but would rather rest in the shade before the evening meal once the sun has lost its power. On our return Henri hooked a few sheep with his shepherds crook. The ones he grabbed were marked with a purple spot on their backs for easy identification, and were in need of treatment, mostly cuts received during the roaming in the woods. The remedies used were lavender essential oil which is a known wound healing product as well as disinfectant, and a sort of tar was used to cover other wounds. Only 4 sheep were in need of treatment, but throughout the day Henri’s eyes were always inspecting the animals as they fed. 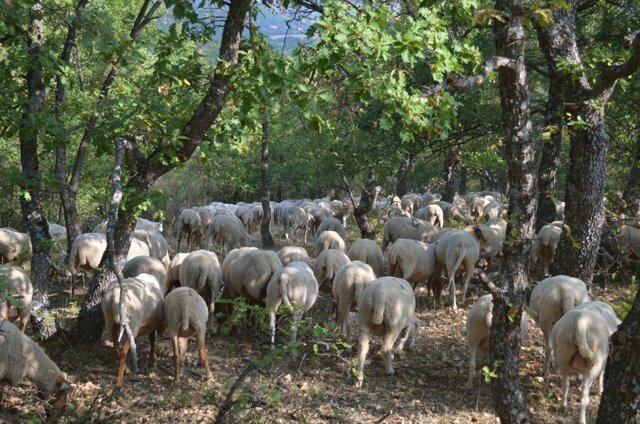 Once the treatments were administered, and the sheep had all drank their fill of water, Costaud installed himself in amongst the flock, ready for any trouble from wolves or any other preying beast, as is expected from the guardian, and as we turned our backs to go home he hopped out discretely to go for a rummage in the nearby wood. 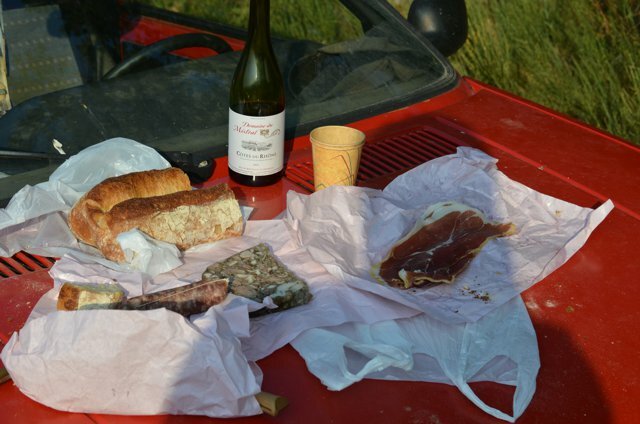 If the idea of meeting a man like Henri or experiencing the way of life and making unique encounters in La Haute Provence interests you, then contact us using the link on the right.